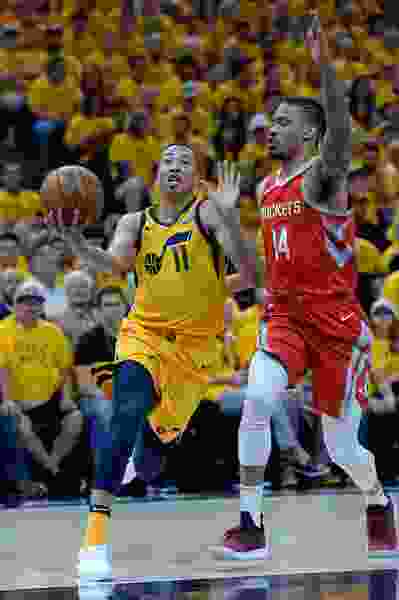 (Francisco Kjolseth | The Salt Lake Tribune) Utah Jazz guard Dante Exum (11) pushes past Houston Rockets guard Gerald Green (14) in the first half of Game 4 of the NBA playoffs at the Vivint Smart Home Arena Sunday, May 6, 2018 in Salt Lake City. Free agency around the NBA officially commences on Sunday morning, and league-wide, the questions on everybody’s minds will be about the fate of LeBron James, Paul George and DeMarcus Cousins. The feeding frenzy will almost certainly skip Salt Lake City. The Jazz will have the full mid-level exception at their disposal, which is about $8.6 million dollars. The Jazz feel they have the chance to extract a good player from a market that projects to be leaner than most. But Utah’s priorities lie elsewhere, regardless. Jazz general manager Dennis Lindsey, publicly and privately, has made it clear he wants to focus on his incumbent free agents. That means the club’s focus will be on keeping power forward Derrick Favors, along with Dante Exum and Raul Neto. In addition, the Jazz extended a qualifying offer to combination forward Georges Niang, making him a restricted free agent. Niang, who has made it clear he wants to remain in Utah, will play summer league for the Jazz. League sources tell The Tribune that the Jazz will make requisite phone calls to the elite free agents. And much has been made of star guard Donovan Mitchell’s friendship with George. But, if the Jazz fall short of getting a major free agent to show major interest, the front office would rather bring the bulk of the team back. Favors is an unrestricted free agent. And while both sides have professed a fondness for the other, Favors figures to receive attention on the open market, and sources say he has piqued the interest from several teams. Exum is a restricted free agent. His injury history is spotty. But he’s still just 22 years old, and has significant potential. The Jazz have the ability to match any offer he receives. Of all the Jazz free agents, he’s the most likely to return. The skinny: Not a perfect fit, but a good fit. He makes the Jazz unique defensively. Utah will make a strong effort to keep the unrestricted free agent. The skinny: Still 22 with loads of potential. Developing into a premier defender. He’s restricted, so the Jazz can match any offer. The skinny: Probably one of the best third point guards in the league. Is always ready to step in and play minutes when needed. The skinny: Was a two-way player who worked hard in practice and became a positive locker room presence. The Jazz like him as a sixth wing. And then, there are Ekpe Udoh, Jonas Jerebko and Thabo Sefolosha. The three have contracts that need to be guaranteed by July 9. Each were rotational players during the season who contributed heavily in the Jazz locker room as well as on the floor. As the calendar hurtles toward July, the Jazz see value in returning with largely the same roster. They were one of the youngest teams in the league last season. They have been together as a group for one year and they feel the roster has a ceiling for improvement. And, financially, the Jazz seem to be gearing up to make a run at free agency next season, when they project to have significant cap space on a market that will feature a number of prominent players such as Klay Thompson from the Golden State Warriors. Bringing the roster back means a shot at a 50-win season. Depending on how the Western Conference shapes up in the next few weeks, it could mean the Jazz are the third-best team in the West behind Golden State and Houston. It gives Mitchell and Rudy Gobert another season to lead a familiar roster. And it gives the roster a chance at a season without an acclimation period, such as last year, when the team underwent significant turnover in the wake of Gordon Hayward’s departure. Does that mean the Jazz won’t do anything? Not necessarily. Favors could sign elsewhere. Exum could sign an offer sheet too rich for the Jazz to match. In that case, Lindsey said, he has an alternate plan. It’s one of the reasons the Jazz are likely to guarantee the three veterans. If Favors leaves, Udoh and Jerebko become important figures in Quin Snyder’s rotation. And Udoh would step in for Favors as Utah’s primary backup center. If the Jazz choose to use the mid-level exception, in this market that could garner a starter, or a high-level backup. Lou Williams, the NBA’s sixth man of the year, signed an extension with the Los Angeles Clippers during the season for a little over eight million. And, there aren’t many teams significantly under the salary cap. If the Jazz had to, they could be aggressive in trying to attract another rotation piece. That ideally would get one more scorer who can create offense for himself and others. There were times last season the Jazz were too reliant on Mitchell, and a second guy who can create could do wonders for the Jazz. Denver’s Will Barton fits that description, and similar fits, such as Avery Bradley and Trevor Ariza, are also on the market. Lindsey must weigh that against his roster incumbents. With Sefolosha getting healthy — he missed the second half of the season after knee surgery — the Jazz figure to be a deep enough team that playing time could be scarce for an incoming free agent, unless someone leaves. It all could lead to a relatively boring free agency for Jazz fans. But, on the flip side, last July was pretty eventful in Utah. Maybe it’s time for a breather.